I am in the middle of my exams, one down and one to go, wahooo! However had a little bit of time on my hands and I thought that I would write a blog post. 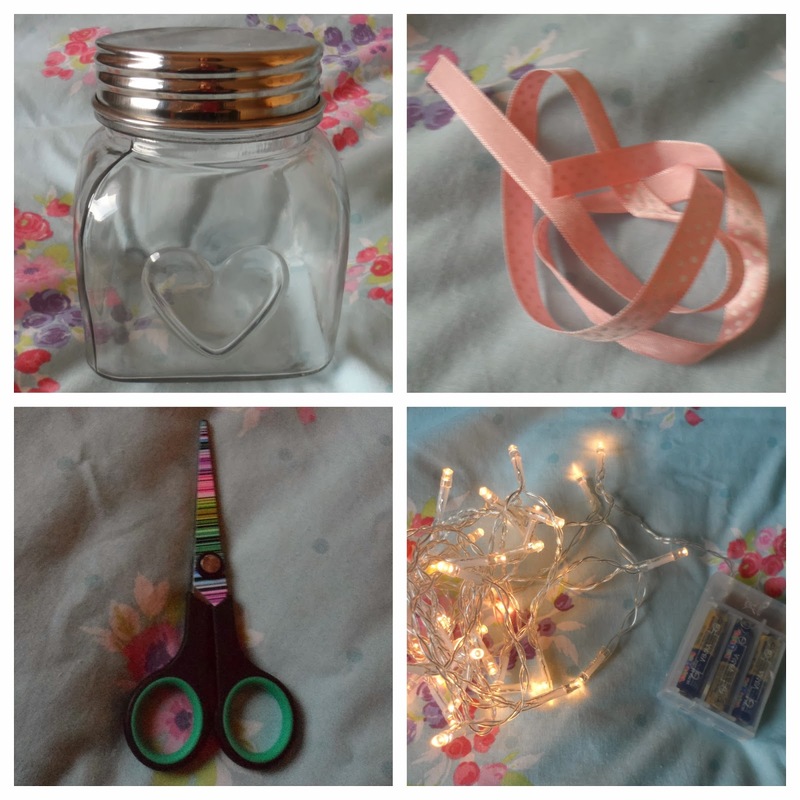 I have recently been loving little craft projects and I have particularly loved this one that I have managed to incorporate into my room and uni and I thought that I would share it with you! 1. A jar of your choice, mine was from TK Maxx and I bought two of them so I could make two lights, I think they were around £3.99 each. 2. Some battery operated fairy lights, now this is important that you get battery operated ones otherwise it wont work as well, my lights are from Amazon and I shall link them here, they were £2.99 each and again I bought two. 3. Some ribbon of your choice, I bought pink ribbon with white polka dots on and I bought mine from The Range here for £1. 4. A pair or scissors and six AA batteries for the lights, if they are the same as mine! 1. When you have all the items all you need, you first have to make sure that the jar is clean and doesn't have anything sticky or dirty inside, just rinse it out with hot water if it does and then let it dry thoroughly before carrying on. 2. Next before you put the lights inside you need to test to make sure they work, just remove the cover of the battery pack and put three batteries in the right way and turn them on to check. 3. Now that you know your lights are working you should separate them a little by just pulling them apart just to make them look a little more spread out when they are in the jar. 4. Now you need to put the lights into the jar and arrange them as well as you can so there is an even distribution of the bulbs, but don't worry too much about that! Also you want to arrange it so that the battery pack either sits at the back out of the jar so you can't see it or on one of the edges if that fits better. 5. Next you are going to cut a length of ribbon, I think my was about 20cm or a bit less and put around the top of the jar and finish it off by tying it in a bow, it doesn't matter if they don't look the same (mine don't). 6. Lastly put the lid back on the top, I haven't screwed mine on I have just placed it on top. And hey presto you have some cheap side lights and mine work perfectly on my desk at uni, I will add a picture of a finished one and what they look like in my room below! Excuse the bad lighting of the last picture, my room at uni is the worst, it hardly lets any light in at all! But that is what the end result looks like and how I have used them in my room! I hope you enjoyed this blog post and it has given you some inspiration to try and do some DIY. Let me know if you do try it out and make your own on twitter or instagram by @ tagging me, my name is megan_godwin on both! After my exam on Thursday I will be blogging more as I won't have as much pressure to revise, so stay with me for a few more days!